Observation - Gall on English oak - UK and Ireland. Description: Gall wasps are rarely seen (often no more than 5mm long), but their effects can be seen nearly everywhere because they are responsible for many plant galls. There are about 90 gall wasps in the UK and 42 of these are known to induce galls on Oak trees. Gall wasps are rarely seen (often no more than 5mm long), but their effects can be seen nearly everywhere because they are responsible for many plant galls. 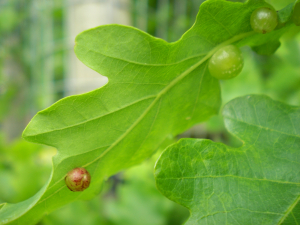 There are about 90 gall wasps in the UK and 42 of these are known to induce galls on Oak trees.